Simply, BabyCakes is your key to an enlightened, indulgent, sweets-filled future. This is important news not only for parents whose children have allergies, for vegans, and for others who struggle with food sensitivities, but also for all you sugar-loving traditionalists. The recipes in these pages prove that there is a healthy alternative to recklessly made desserts, one that doesn't sacrifice taste or texture. Having experimented endlessly with alternative, health-conscious sweeteners, flours, and thickeners, Erin McKenna, the proprietress of beloved bakery BabyCakes NYC, developed these recipes–most are gluten-free, all are without refined sugar–in hopes of combating her own wheat, dairy, and sugar sensitivities. In BabyCakes, she shares detailed information about the ingredients she uses (coconut flour, xanthan gum, and agave nectar, for example) and how to substitute them properly for common ones–all the while guiding you safely through techniques she’s spent years perfecting. When BabyCakes NYC opened on Manhattan’s Lower East Side in 2005, it helped propel the gluten-free and vegan baking movement into a new stratosphere. Suddenly there was a destination for those with wheat allergies and other dietary restrictions–and, soon enough, celebrities and dessert lovers of every kind–to indulge freely in delectable muffins and teacakes, brownies and cookies, pies and cobblers. Enclosed within these pages are all the “secrets” you’ll need to bring the greatness of BabyCakes NYC into your own home as well as raves and recommendations from devotees such as Natalie Portman, Jason Schwartzman, Mary-Louise Parker, Zooey Deschanel, and Pamela Anderson. For confectionists of all kinds, delicious alternatives lie within: Red Velvet Cupcakes, Chocolate Shortbread Scones with Caramelized Bananas, Strawberry Shortcake, and BabyCakes NYC’s celebrated frosting (so delicious it has fans tipping back frosting shots! ), to name just a few. Finally, Erin’s blissful desserts are yours for the baking! ERIN MCKENNA is the chef and owner of BabyCakes NYC, a bakery with outposts in New York City and West Hollywood. She received the prestigious Best Cupcake award in 2006 from New York magazine. Erin has been a guest on Martha Stewart Television and Food Network and has been featured in the New York Times, Food & Wine, Modern Bride, VegNews, Harper’s Bazaar, In Style, and O, the Oprah Magazine. "In this book, Erin has finally shared her trade secrets — the ingredients and techniques that lend BabyCakes' desserts the flavors, textures, and happiness-factor you'd find in the best patisserie. The highest praise I can offer is this: follow her recipes to the letter and you'll fool them every time." 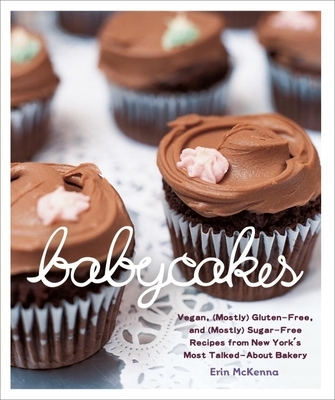 "At BabyCakes NYC I can eat what I crave without harming my lovely animal friends–or myself. Every since that first fateful day, I’ve been waiting for this cookbook." "I have multiple food sensitivities…and I’d pretty much given up on the idea that I might be able to have a worthy treat every again. I was so excited to discover BabyCakes NYC, because not only can I eat everything they bake, it’s all delicious!" "The BabyCakes NYC banana bread is the best I've ever had and something I simply can't live without." "Thank all that is holy for BabyCakes NYC…"